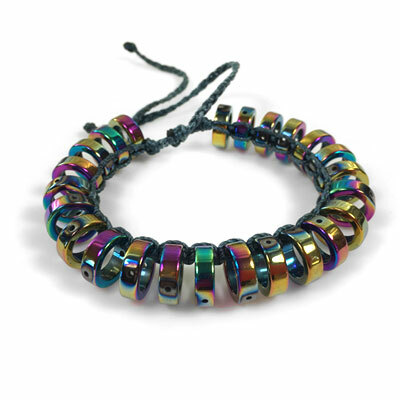 Rainbow titanium hematite rings are knotted and braided with nylon cord. The nylon color is a subtle deep blue green color called Marina. The rainbow titanium coated hematite rings are man-made and finished with a permanent multi colored titanium finish. Modern design. One size fits all. 12 mm wide. Rainbow titanium coated hematite. Nylon cord. Sliding closure. Adjust to wrist size. Can be stacked. Available on order. Add 3-5 days for production time.